Today we review the third Mikuru in the figma series, Combat Waitress Mikuru! She hails from the first episode of The Melancholy of Suzumiya Haruhi (涼宮ハルヒの憂鬱 – Suzumiya Haruhi no Yuuutsu) during the movie the SOS団 (SOS Brigade) made for the culture festival. It’s difficult to tell, but I’m trying something a bit different for images of the full set picture. 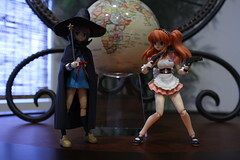 I will endeavor to perfect this technique, as it looks as if it’d be pretty neat ;) Anyway, This Mikuru comes with the standard 3 jointed figma stand and base and extra face. with a blue left eye for the Mi-mi… Mikuru Beam!!! 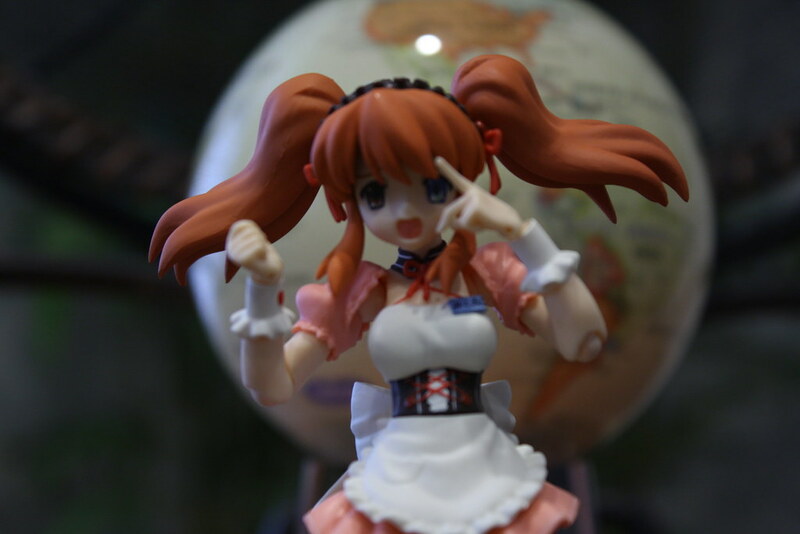 Mikuru’s twintails are connected to her head the same as the other non-Miku styled figmas, with a small clear ball joint into a small pit in the head. Weaponry includes the 2 guns she uses against Nagato in the movie. I’m sorry, but I’m not a gunmaniac, so I don’t know what kinds of guns they are, sorry! Also included is the reindeer head for Kyon, and a nice shocked face for him too! The reindeer head splits apart like a regular figma head and comes with its own figma joint as well, and the face is swappable too! 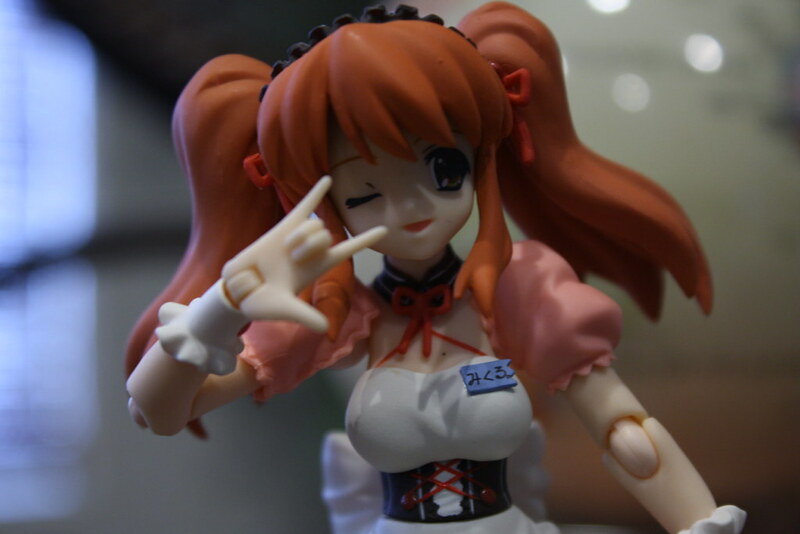 The leftmost hand is similar to the *kira* hands from the Kagami Miku cosplay figma. She actually uses that configuration when fighting Nagato in the movie when she starts attacking with the different style Mikuru Beams. I wonder why they didn’t include one for the left hand? The middle hand is the Mikuru Beam hand. The 2 on the right are molded specfically to weild the 2 guns she comes with. The pointer finger actually slips into the trigger! Be careful when equipping though, as you don’t want to accidentally snap it off! The finger is very flexible, so I doubt you could even break it if you tried, but better safe than sorry! Even though the arm ends in a cuff instead of a bare wrist, the same ease of swapping design used in the Cheer Girl figmas is there. 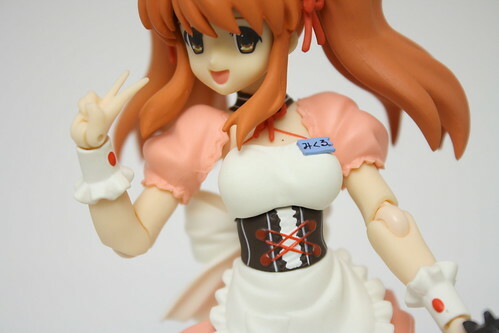 I think this figma is also wearing a push-up bra, as her assets look considerably larger in this figma than in the other two ;) If you have the other 2 Mikuru figmas, that gives you a whopping 7 different faces to use with her!!! She has a standard smiling face, a cowering face, and a scaredy-cat face from the original Mikuru and an open mouthed smiling face and determined face from Cheer Girl Mikuru. Clearly they intend to make Mikuru the figma with the most expressions of the entire line! Cons: Um… the mold on the right twintail could’ve been sanded down more? I don’t know! I love this figma so much!!! 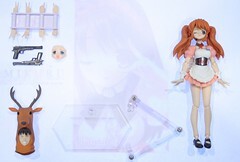 So far, the figma line has figmas that the Fräulein Revoltech line has; Bad Witch Nagato Yuki, Winter Seifuku Suzumiya Haruhi and this Combat Waitress Asahina Mikuru. Will we be seeing a Bunny Haruhi and Mikuru next? I certainly hope so! She is currently sold out at Hobby Search, but if you manage to get her when she is restocked, their current price is ¥2,261. She is currently labelled as Discontinued at Hobby Link Japan, but should she come back in stock there, she costs ¥2,381 there. I certainly am glad I decided not to wait to order her!!! HIGHLY RECOMMENDED!!! 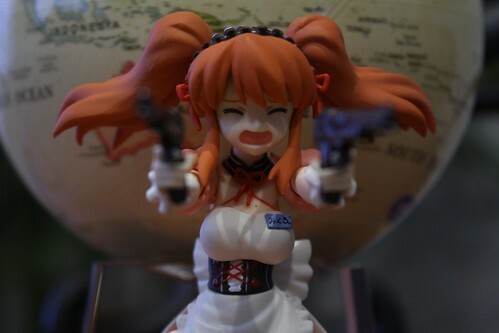 I would have preferred a 3rd face and a hand with a fired Mikuru Beam instead of the deer head but otherwise I love this figma. 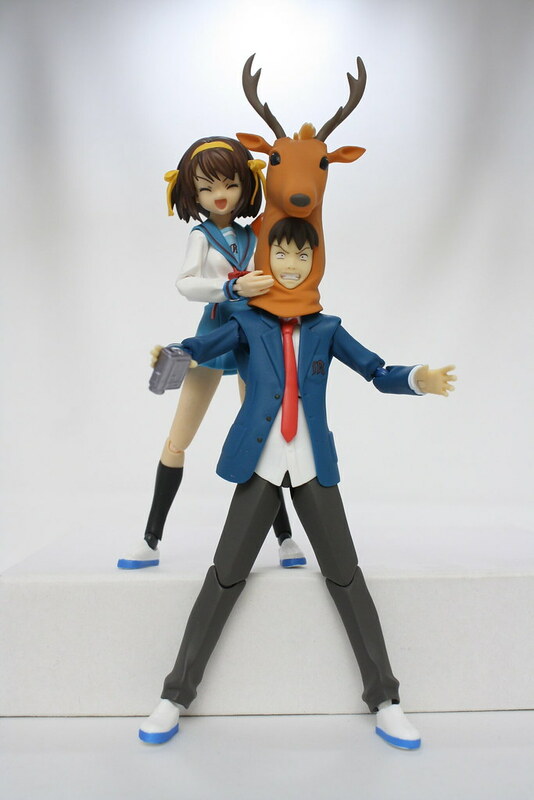 Oh I see the deer head for Kyon is in this one. Hmmm… tempting. 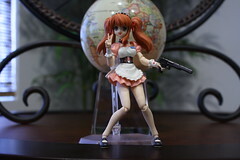 A lot of WIN in this version of Mikuru!